'Farnsworth', the Cornelius Kingsley Garrison (C.K.G.) 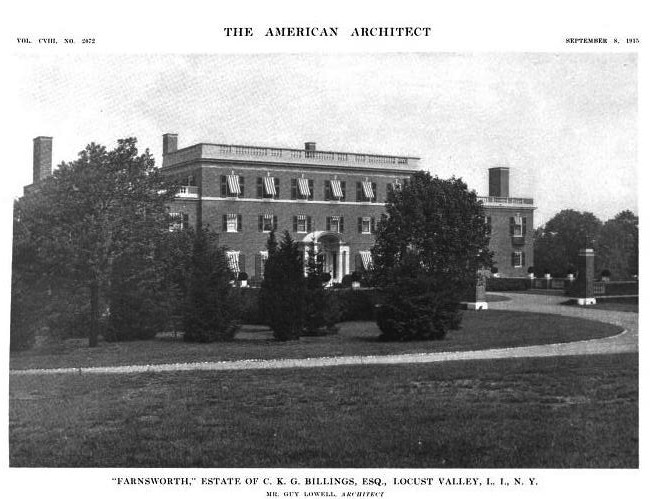 Billings estate designed by Guy Lowell c. 1914 in Matinecock, with landscaping by A. Robeson Sargent. Billings was president of Peoples Gas Light and Coke Co., Chicago and chairman of the board of Union Carbide and Carbon Corporation. The estate was demolished c. 1966. 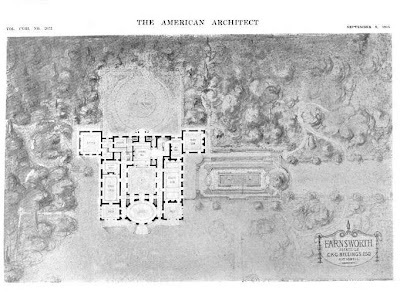 Click HERE for more on 'Farnsworth' and HERE to see what's left of the estate. Click HERE to see where 'Farnsworth' stood on google earth. Note the really wonderful brickwork. With all the money that goes into high-end houses, why don't more people do that today? P.S. If the owner didn't shoot those bears himself, deduct points in calculating final score. Amazing house -- I would have never left that oval music room. Sad it lasted only 52 years & part of that time it was just sitting & rotting. But, like Ancient, I count six animal hides on the floor in just that one picture (brown bears, polar bears, a lion) -- it's also sad that part of the mentality of that era included the casual slaughter of large numbers of animals. It is an interesting plan with that central court which I assume is glassed in on the first level and then open for the floors above. I cannot read the floor plan but wonder if the kitchen is in the square space in the upper left hand corner, or in the basement. It is strange that there is no separate accommodation for delivery vehicles although there appears to be a secondary entrance adjacent. I'm with Doug on the excess of dead animal strewn around the house (sorry, Teddy Roosevelt), just as I was repelled last Friday by Mona's sealskin rug (that, and selling her young son to her first husband for an annuity rather tarnish Mona's glamour for this guy). As for the kitchen deliveries, I think I spy a hint of circular drive through the trees to the left of the kitchen. 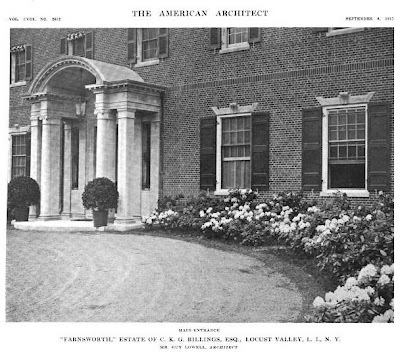 Here is a link to a post on Mansions of the Gilded Age, which shows the original entrance gates. 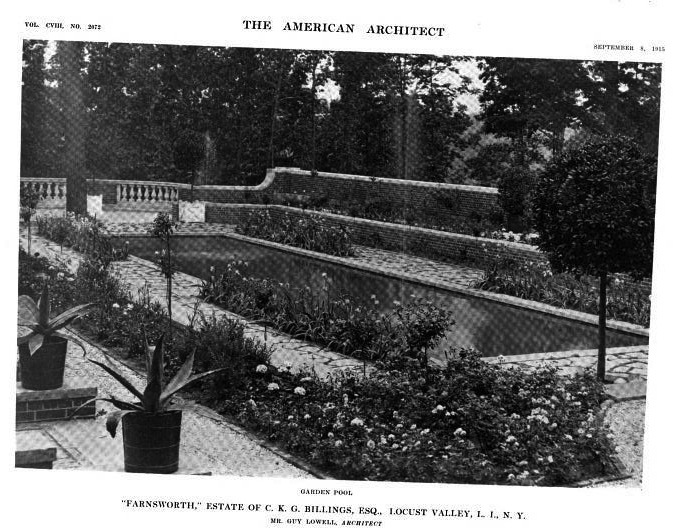 Just finished reading the extraordinary article about building the driveway at Fort Tryon. Near the end, in description of the house, it mentions the covered interior courtyard at the Fort Tryon house, obviously a feature so well liked by Billings that he incorporated the same feature into the Long Island House. Always interesting to see what happens as architect and client merge their ideas. Outstanding house, grand floor plan and the highlights are of course the oval pompeiian style music room and the incredible central courtyard. Always thought this home to be spectacular. Plus the Billings Manhattan home with a similar courtyard is a very nice touch. The arcade and entry drive remnants are still visible from the parkway in Manhattan. Odd that such a gracious house should have such a sordid past; C. K. G. Billings hosted the (in)famous Horseback Dinner at Sherry's Hotel in March, 1903. 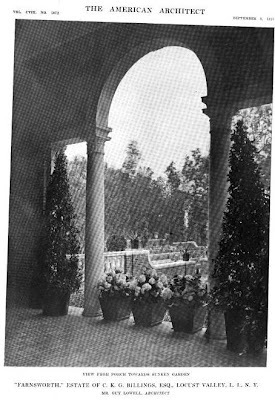 Author Greg King credits it as one of the events that rang down the curtain on the Gilded Age in his book, A Season of Splendor (in which, completely off topic, he noted that Thomas Edison installed the first instance of indirect lighting in the United States in the dining room of Belcourt, O. H. P. Belmont's house in Newport, in 1894 for you purists). 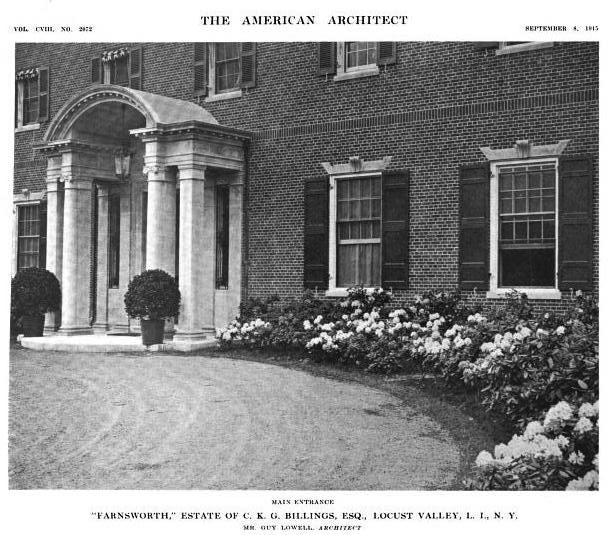 ...and I wept when the sublime superintendent's "cottage" was demolished to make way for a crass McMansion. Security word - ocrati: a group of snobs who cannot decide what group to exclude the unwashed masses from yet. Ever wonder what you might be served at a horseback dinner? I was under the impression that many of the outbuildings are still extant and turned into private residences. You're quite right. Check the Wiki map links for what's on the tax rolls. • Yes, the large square room on the upper left is the kitchen, which makes that a really large kitchen. • From the kitchen there is a small L-shaped room with no name on it then into the butler’s pantry, again really large, & then the dining room. • From the kitchen there is a small square room with the servants’ stairs in it & then to what I think is a reception room. • I believe those are small toilet rooms on either side of the front door, each with a discreet hallway getting to it. • The entrance hall is an impressive layout: as you enter there is the fountain court & beyond in front of you, a fireplace is on the wall to your right, & to the left you see you’re actually in another, smaller hall with the main stairs at the other end. There is also an elevator in this hall. • There is a door under the stairs into a room where I can read the word “Den,” which leads into a large, square room the balances with the kitchen on the exterior – I would think this is the library but the name on the plan doesn’t seem to say library. • Notice as you descend the stairs you’re looking down a long hall at a window at the other end of the house – nice line of sight. • The large rectangular room on the right says Drawing Room. • There are porches (which I would have called loggias) flanking either side of the oval room, which I always thought was the music room but here is called a loggia. Regardless, it is well done the way each of those long halls feed into this oval room & to the left there is a fireplace on what is actually the wall of the hallway. 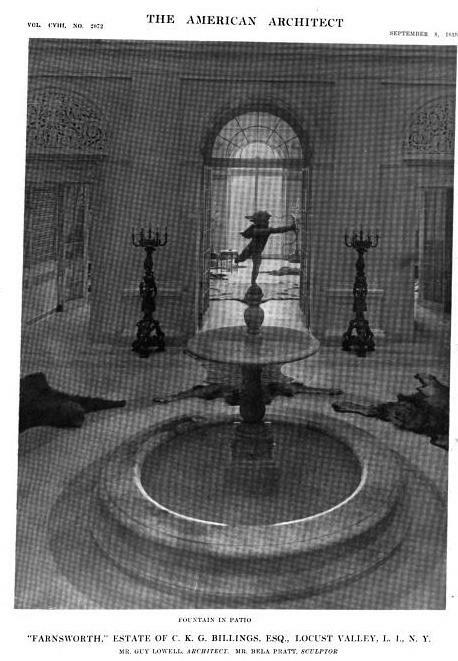 • The center fountain court was glassed in at the roof with the upper floors open to the atrium this created. There, just thought I’d throw in what I figured out – damn, this was a great house. Great house indeed. I'll add, btw, that I figured out the answer to TDC's question about service entrance. It clearly was at Basement level, as was often the case with the largest houses---on the map, one can make out the circular service drive. In the photograph of the service wing, one sees the drop in grade, and a roof that must have sheltered the service entrance. 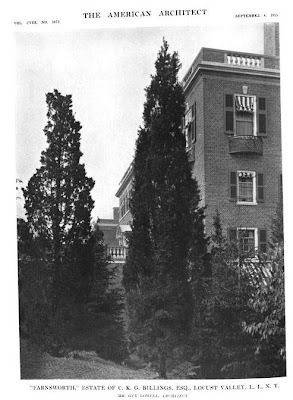 The article in Bricklayer mentions that although the house appears to be three floors, there were actually six levels--a mezzanine over the kitchen, basement and sub basement, and best of all, a recreation deck on the roof. Oh to be rich and eccentric 100 years ago. Oh to be rich and eccentric 100 years ago. It's not that it's so bad to be rich and eccentric today, just that your odds of building something wonderful -- instead of something vulgar and ugly -- were once limitlessly greater. Suggestion/Question: any way you can include the scale of feet for these floor plans?? it is important to know the size of the rooms/frontage structures, gardens, etc. Otherwise, it's just guess work!!! While I believe it is rare indeed for a house to be truly worthy of the attribute "masterpiece", this one certainly seems to make the grade. Why, oh why could someone not have come along who appreciated the deliciousness of this place and all it represented so that we might still have the opportunity to behold its grace today? Oh, and Ancient, the bricklaying techique to which you refer in your original comment utilizes a pattern with alternating courses of headers and stretchers and is known as "flemish bond".